Laika (Russian: Лайка, meaning "Barker"; c. 1954 – November 3, 1957) was a Soviet space dog who became one of the first animals in space, and the first animal to orbit the Earth. As little was known about the impact of spaceflight on living creatures at the time of Laika's mission, and the technology to de-orbit had not yet been developed, there was no expectation of Laika's survival. Some scientists believed humans would be unable to survive the launch or the conditions of outer space, so engineers viewed flights by animals as a necessary precursor to human missions. Laika, a stray dog from the streets of Moscow, was originally named Kudryavka (Russian: Кудрявка Little Curly). 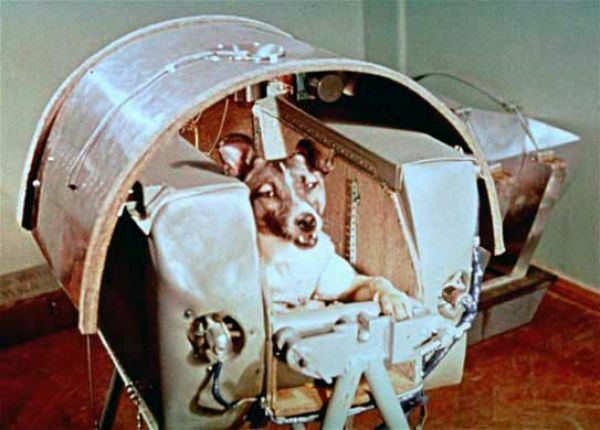 She underwent training with two other dogs, and was eventually selected to be the occupant of the Soviet spacecraft Sputnik 2 that was launched into outer space on November 3, 1957. Laika died within hours after launch from overheating, possibly caused by a failure of the central R-7 sustainer to separate from the payload. The true cause and time of her death were not made public until 2002; instead, it was widely reported that she died when her oxygen ran out on day six, or as the Soviet government initially claimed, she was euthanised prior to oxygen depletion. The experiment aimed to prove that a living passenger could survive being launched into orbit and endure weightlessness, paving the way for human spaceflight and providing scientists with some of the first data on how living organisms react to spaceflight environments.